﻿ 10G SFP + optical module summary, you want to know here are! As we all know, SFP + optical module because of its small size, low cost and high density and other advantages are widely used in 10G Ethernet, is the current data center, enterprise park the most common 10G optical module. 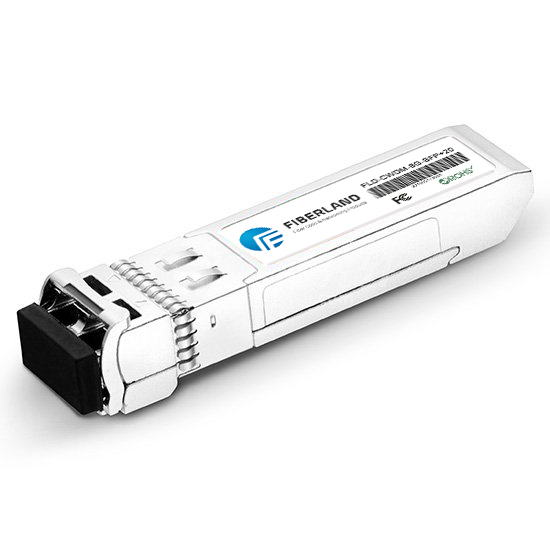 Today, Fiberland will introduce some of the 10G SFP + optical module types and the difference between them. What are the types of 10G SFP + optical modules? 10G SFP + series optical modules include SR, LRM, LR, ER, ZR, BIDI, CWDM, DWDM and 10G electrical interface modules, all of which are LC duplex and comply with IEEE802.3ae, SFF-8472 and SFF-8431 Standard, the following are some of the specific details of the optical module. 10GBase-SR is one of the Ethernet specifications, the 10G SFP + SR optical module conforms to this standard specification, and the SR in this optical module model is short-range, which means that it is with multimode fiber Using a transmission distance of up to 300m. In addition, 10G SFP + SR optical module wavelength is 850nm, with low cost, low power consumption and small size, high density advantages. The 10G SFP + LRM optical module conforms to the 10GBase-LRM Ethernet specification, where LRM refers to the Long Reach Multimode. 10G SFP + LRM optical module can be used with OM1, OM2, OM3 multimode fiber, and mainly used for FDDI network and 10G data communication, its low power consumption and excellent EMI can also fully meet the MSA SFF-8431 standard. In addition, the upgraded version of the 10G SFP + LRM optical module is the SFP-10G-LRM2 optical module. The upgraded optical module has a transmission distance of up to 2km and is typically used for LAN connectivity. The 10G SFP + LR optical module complies with the 10GBase-LR Ethernet specification, where LR refers to a long range, with a maximum transmission distance of 10 km on a single-mode fiber with a wavelength of 1310 nm, and a maximum of 25 km, But also has the advantages of miniaturization, low power consumption and long transmission distance. The 10G SFP + ER optical module complies with the 10GBase-ER Ethernet specification, where ER is the Extended Range, its wavelength is 1550nm, and the transmission distance of up to 40km when used with single-mode fiber is a cost Very high ultra-long distance optical module, currently in the data center and enterprise park favored. The 10G SFP + ZR optical module conforms to the 10GBase-ZR Ethernet specification, but this specification is proprietary to Cisco. 10G SFP + ZR optical module model ZR refers to the longest distance (Ze best Range), which shows that this section of the optical module transmission distance is very far, and single-mode fiber with the transmission distance of up to 80km, This kind of optical module is widely used. BIDI optical module is a single fiber bi-directional optical module, this optical module has SFP and SFP + two packages, the main difference is that the BIDI SFP + optical module rate is 10G, BIDI SFP optical module rate is 100 megahertz or gigabit. The BIDI SFP + optical module uses WDM technology and has two fiber jacks that need to be used in pairs to ensure proper operation. However, the benefits of this optical module can reduce the amount of fiber used in network deployments and greatly reduce network Deployment costs. 10G SFP + CWDM optical module is a coarse wavelength division multiplexing optical module, usually used with single-mode fiber. This optical module saves fiber resources by using CWDM technology, which significantly increases the flexibility, economy and reliability of the network, and the power consumption of this optical module is very small, which is 12.5% ​​of the 10G SFP + DWDM optical module. 10G SFP + DWDM optical module is a relatively rare high-speed, large-capacity dense wavelength division multiplexing optical module, usually used with single-mode fiber, the transmission distance of up to 80km, suitable for long-distance data transmission. This kind of optical module can meet the needs of large capacity and ultra long distance transmission for the multi-service operation and the future network expansion and expansion to provide a stable protection, but also supports a variety of networking mode, the nodes can also be between the wavelength Scheduling, with easy expansion of capacity, business access flexibility, high bandwidth utilization and high reliability and other advantages. The 10G electrical interface module is a photoelectric conversion module in the form of SFP +. The interface type is RJ45, usually used with super six or seven types of network jumper. The disadvantage of this optical module is that it does not support DOM function, and the transmission distance Is 30m, because the scope of application is not wide enough. In order to make it possible to distinguish between 10GBase-SR, 10GBase-LRM, 10GBase-LR, 10GBase-ER and 10GBase-ZR 10G SFP + optical modules, the following table lists the comparison tables for these optical modules. 10G SFP + optical modules are widely used in next-generation mobile networks, fixed access networks, metropolitan area networks, and data centers. Fiberland fully meets the needs of customers with different transmission distances of 10G SFP + light through a strong inventory system and complete delivery services Module needs, need to buy friends welcome to contact us.